Bartle Hall Hotel near Preston in Lancashire was the exclusive wedding venue for Jennie and Mike's winter wedding. We met up for a leisurely pre-wedding consultation over a coffee in the very comfortable contemporary lounge at Bartle Hall, this was the first time I met Mike, Jennie's Groom. We discussed their wedding plans and whilst we wandered around the 16 acres of serene Lancashire countryside we chatted about the wedding photography brief. 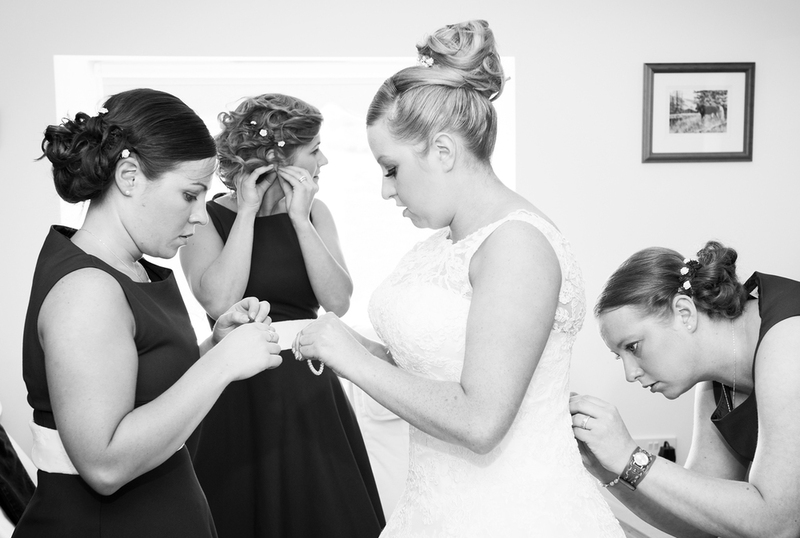 Jennifer getting ready with her bridesmaids before leaving for St. Johns Church Hutton Roof and her wedding! It was December 2012 when Jennifer first inquired about our wedding photography. She had booked the magnificent Grange Hotel, Grange-over-Sands for her wedding reception venue and they had recommended our wedding photography. The splendid half timbered black and white Samlesbury Hall provided a splendid backdrop for these photographs of the Groom and Bestman, identical twins. Kerrie & Robert's First Wedding Anniversary! Exactly this time last year I was preparing my photography gear in readiness for Kerrie & Robert's Autumn wedding at the magnificent Samlesbury Hall, near Preston in Lancashire.